Cellulitis is an acute spreading inflammation of the skin and subcutaneous tissues characterised by pain, warmth, swelling and erythema. Cellulitis can be difficult to diagnose and to distinguish from other causes of inflammation in the legs but cellulitis most commonly affects one leg only. 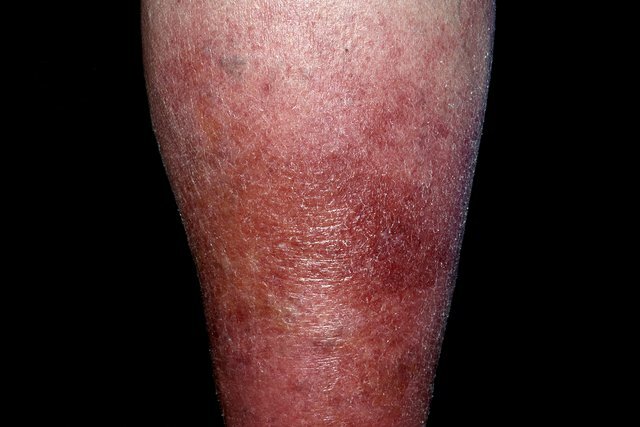 If the patient presents with bilateral ‘red legs’, it is likely to be associated with venous hypertension / insufficiency (Refer to swollen legs and feet section of the website). In lymphoedema / chronic oedema, attacks of cellulitis vary in presentation and may differ from classical cellulitis. Microbiology of any cuts or breaks in the skin – this should be considered before antibiotics are started. Prompt treatment is essential to avoid further damage to the lymphatics of the affected part as this may predispose to repeated attacks. Antibiotic therapy is required to treat cellulitis. As with any infection, the choice of antibiotic prescribed is determined by the presumed bacteria. This is more difficult for cellulitis as rate of positive blood culture is known to be low. When prescribing antibiotics, you should also consider drug allergies, specifically to penicillin and drug interactions, particularly when prescribing macrolides. If there is no response or a poor response (inflammation is not resolving) to oral antibiotics after 48 hours of treatment, then you should consider prescribing second line antibiotic therapy. If signs or symptoms deteriorate despite oral antibiotics, then you should consider hospital admission for intravenous antibiotics. Antibiotics should be continued until all signs of acute inflammation have resolved. For the treatment of cellulitis in people with leg swelling this may mean taking antibiotics for 1-2 months. It is recommended that the course of antibiotics should be for no less than 14 days from the time a definite clinical response is observed. Skin changes e.g. discolouration / staining may persist for months or longer following severe cellulitis and do not necessarily require ongoing antibiotics. Bed rest and elevation of the affected part is essential. When inflammation is sufficiently reduced, normal levels of exercise may resume. A return to work depends on the patient’s occupation and there being no deterioration when normal levels of exercise are established. You should advise your patient to avoid compression garments during the acute attack. These should be replaced as soon as the affected area is comfortable enough to tolerate them though. You may need to check the fit of the compression garment as the area may become more swollen after an episode of cellulitis. You should advise your patient to take analgesia. Paracetamol is currently recommended as the first line choice of analgesia as there are concerns that NSAIDS prescribed during an episode of infection may increase the risk of necrotising fasciitis. Encourage patients to use emollients as part of their skin care routine. This will optimise the skin’s natural barrier function and reduce the risk of recurrent cellulitis. Inter-digital fungus should be treated with application of terbinafine cream daily for two weeks. Lymphoedema treatment (decongestive lymphatic therapy – DLT) is thought to reduce the frequency of attacks. Patients who have had an attack of cellulitis should carry a 2 week supply of antibiotics with them particularly when away from home for any length of time, e.g. on holiday. You should advise your patient to start antibiotics immediately if they observe familiar symptoms of cellulitis develop, but to seek a medical opinion as soon as possible. You should consider antibiotic prophylaxis in patients who have two or more attacks of cellulitis per year. It may not be possible to fully prevent further episodes of cellulitis even with prophylactic antibiotics. However, there may be a reduction in the frequency of cellulitis and / or the severity of episodes. Following two years of successful prophylaxis, discontinuation should be considered, particularly if the risk factors have been successfully addressed. However, if there are ongoing significant risk factors, continuing prophylaxis should be considered. Prophylaxis may need to be lifelong if relapse occurs after prophylactic antibiotics are discontinued. These guidelines give you a useful overview and more detailed information about cellulitis within the context of lymphoedema. Research evidence to support practice includes a number of systematic reviews about venous leg ulceration. The Cochrane Library publishes systematic reviews about the effectiveness of many treatments for cellulitis. The British Lymphology Society (BLS) is a dynamic and innovative body providing a strong professional voice and support for those involved in the care and treatment of people with lymphoedema and related lymphatic disorders, including lipoedema.